I saw “American Graffiti in the Shore 1,snuck into the Shore 2 to see "The Seven-ups”.Shame on me! Looking at the photo section I see the image of the Shore when it opened. There was a narrow marquee but no sign boards. Latter in it’s life a huge signboard was affixed to the front of the building. You could read it a block over, New York Av, which was the main drag. Probably the intent. Would like to see a photo with that. At the time Century announced it would build the Shore it also indicated it would build a 1,000 seat theater in Huntington Station, in addition to the one which was already there. It was felt that, the way the area was developing, it could sustain two theaters in the village and two in the “Station”. The second theater in the Station was never built and, when the neighborhood went down the Station was closed. Century did, however, subsequently open two theaters in what was technically Huntington Station: the York in the Big H Shopping Center and the Whitman at the Walt Whitman Mall. 1950 and 1972 grand opening ads has been uploaded in the photo section for this theatre. The heading is way out of date. By 1981 the RKO Century Warner ads showed three auditoriums. A forth was subsequently added before closure and subsequent demolition. The beautiful exterior looked really sad in it’s final days with the wooden colonial accents peeling and rotting. Saw “The Towering Inferno” here. That was the last time I sat through a movie that had an INTERMISSION ! No wonder I couldn’t find it by name. All those dashes between components. Re a comment way back, the 110 Drive in was actually in Melville at the western intersection of Rt 110 and the north service road of the Long Island Expressway. It was a big one 2, 500 cars. After a lot of research on this site I couldn’t find it and have made an attempt to post it. Wish me luck it’s my first posting. Boxoffice Magazine’s issue of April 1, 1950, carried an item saying that Century Theatres planned to open the new Shore Theatre in Huntington on April 8. 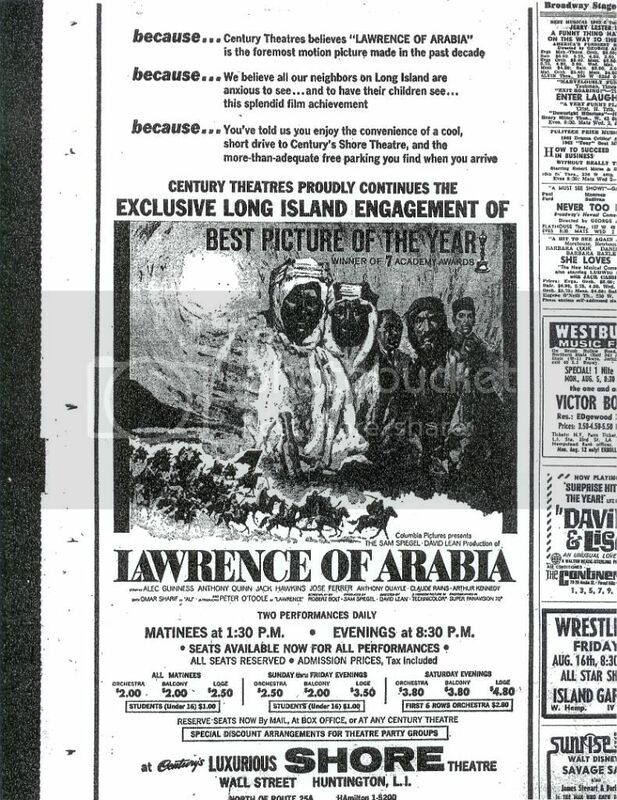 In its December 16, 1974 issue, Boxoffice said that Century was selling the Huntington Theatre in Huntington, but would still have two screens in the town because their Shore Theatre had been twinned. A New York Times article about the theater business on Long Island, published January 27, 2002, said that the 8-screen multiplex that had replaced the Shore Theatre in 1998 was designed by architect James Thomas Martino of Port Washington. This was the last building spree by Cineplex Odeon, They built this one, Quartier Latin 17 and St. Bruno 11 in the MontrÃ©al area, the South Keys 12 in Ottawa, The renovention of the Varsity in Toronto, Ajax 10, 401/Morningside, the Canyon Meadows 10 in Calgary, which they lost when they failed to pay the rent, and the 3 theatres built with the partnership on Inner City Entertainment in Chicago. All the grand opening ads had the same design. In 1998 they merged with Loew’s. I was Managing Director of the Shore from 1999-2004. Cineplex ran out of money as it was being built and slapped it together at the last minute. As a result, the theatre only had one escalator going up, but none coming down, never had a marquee as it was originally supposed to and was rather nondescript considering it’s the largest building in the village. The projection and sound systems, however, were some of the best anywhere. The former (Cineplex) manager there didn’t care much for it, but I knew all it needed was a little TLC. Within a couple of years by replacing most of the managers and staff and reaching out to the community the annual attendance almost doubled. While I never got all of what I wanted, I think we made it a great place for families to see movies. I’m sickened by what AMC has done to the late-great Loews by systematically purging all of the former Loews managers. There are nearly none of them left. I’ll never see a movie in an AMC theatre. The bowling alley became a supermarket in the early 1980’s (not the late 1970’s as some posted above). I believe it was 1982 or so? Warren do you know was this the only bowling alley that Century had? I worked at The Shore as an usher, summer of ‘72. The theater had JUST been converted into a “double” theater, by sealing off the balcony and making that “Theatre 2” (or whatever the “upstairs” theatre was called. God help you if it sold out and you were in one of the end seats, next to the wall!) Ed Fatscher was the manager, and I thoroughly enjoyed my time there, brief though it was. Of course, we had uncommonly fabulous titles in the the few months I was there: Clockwork Orange, Cabaret, The Other, The War Between Men and Women, Prime Cut (with a very young Sissy Spacek), and my favorite, The Heartbreak Kid. All in one summer! 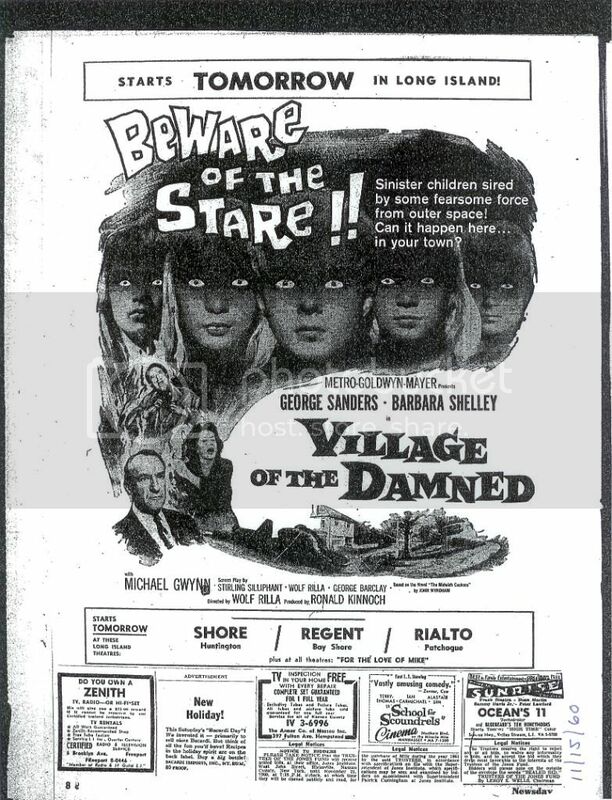 Sometime in the late seventies, the Century chain of movie theatres changed its way of doing things and the Shore, which had been a bit of a showcase, was essentially allowed to deteriorate until, some time in the mid-nineties, a petition began appearing in local shops in Huntington, urging the town to force the theatre to revamp or shut down. The petition worked and the Shore (no longer Century by this point) was rebuilt on the exact same spot, becoming an eight-screen theatre. Century, in the late seventies, lost a lot of good will when its management decided to sell an incredibly deluxe bowling alley across the street. It became a supermarket overnight. I worked in Shore 8 – Cineplex Odeon in 2003 after spending 2 years prior at the Stony Brook 15. This theatre has some of the best Sound on Long Island. The Shore 8 is actually owned by Loews Cineplex. Its a nice theatre, huge lobby with a great game area for the kids. There is an elevator and a pair of escalators as well. There was an outside walk up box office until about March 2003, when a local drunk “remodeled” the front and the box office was relocated inside to the left of the concession stand. I worked at the Shore as an usher from about 1984-1986, and than as assistant manager from 1986-1988. I don’t think there was a fire there. I’m pretty they just tore it down to build the new one, and it is definitely in the exact same place. The Shore was originally 1 theater, and they cut it into four, 2 upstairs and 2 downstairs. But they kept the old seats, and not of them quite faced the screen head-on. GREAT PICS WARREN ….. both theaters should be on the same site. The original Shore Theatre was torn down and the multiplex was built on the same site. Cineplex Odeon is the most recent in a long line of owners. We had Almi Century, RKO Century and Cineplex Odeon. The address is the same. I hope this help to eliminate some of the confusion. I did work with Mario Bello and the name of the matron was Beth Ammar. Gosh, I dragged my parents half way across the island to see “The Posiedon Adventure, it was the ony theatre playing it in stereo. It was only two theatres then. Large and lush. Reminded me of The Bayshore. Only went back once more to see "Harry & Tonto”.